I had been craving “something corn” for quite a few weeks now; something corn which is slightly sweet and a lot spicy. We went for a Mexican dinner where there was a cutest loaf of sweet and spicy corn bread. It was delicious and the taste lingered making me crave on and off for a long time. Then I had a corn casserole in DD2’s school during a get together (well casserole is not bread, but it did have the same flavors and taste) and I started wanting it even more. 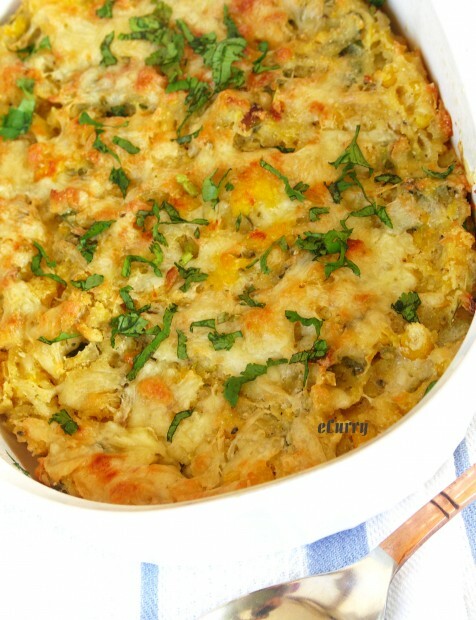 This recipe of the casserole is done without using any egg. I was a little worried before I started cooking, not knowing if it will set (I wanted it of the texture which could be cut out like a cake) enough without the egg. But it did very well! Pulse the 1/2 cup milk and the corn kernels in a food processor for a short while. Part of the corn kernels will be broken, the rest remain whole. Combine salt and the corn meal to the corn kernels and set aside. Melt the butter in pan. Add the onions, chili peppers and cook till the onions are soft. Lower the heat and add the flour and black pepper to the pan while stirring quickly, so the flour does not lump. Add milk in a slow, steady stream while stirring continuously to make a thick sauce. (This is almost like making Roux/white sauce). Stir in the chopped cilantro, sugar, corn and the corn meal mix to the pan till well combined. Pre heat the oven to 350 degree F. Grease/spray an oven proof baking dish. Transfer the corn mixture from the pan to the baking dish and flatten it to form an uniform top. Sprinkle the cheese evenly on the top and bake for about 30 -35 minutes till the cheese melts and starts to crisp. Carefully remove from the oven and cool for about about 10-15 minutes. 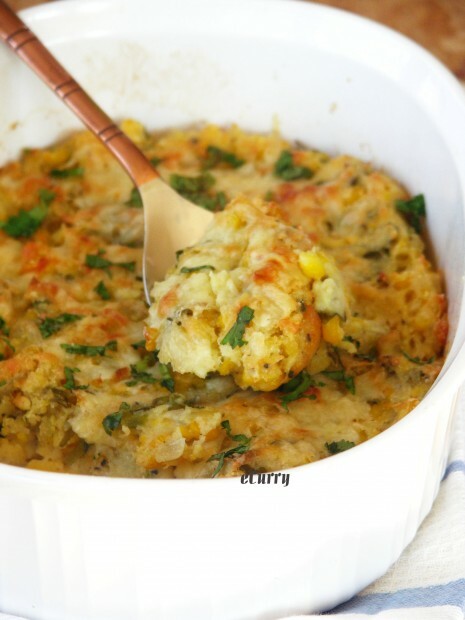 The corn casserole should be set enough to be spooned out or cut and scooped out clean. It indeed was a very happy meal, loved by all. Will I make it again? Yes! very often! It stays very well in the refrigerator for a couple of days. Just needs to be warmed up before serving. And if you happen to be like me, you would eat it even cold. March 8th, 2010 | Category: Sides & etc. Wow, this sounds like a great side dish. love corn and in this way it’s a meal on its own. great one! Oh My god!That is one fantastic looking one pot meal, Soma! A wonderful casserole! Tasty and healthy. You can’t have better! Now I am craving corn! This dish sounds and looks delicious. I always enjoy your recipes. Such an inspiration! Soma, have been visiting but my busy schedule has not permitted to leave elaborate comments and since I am never the one for “Nice, looks yummy” here goes: First of all, I love corn too and I haven’t had it in months. Don’t ask me why, it is a long story. Anyways, I have a bag of frozen corn kernels sitting in the freezer and I am gonna make this delicious casserole just for me. 🙂 I am thinking, some ricotta may also taste good with this so will have to figure that one out. 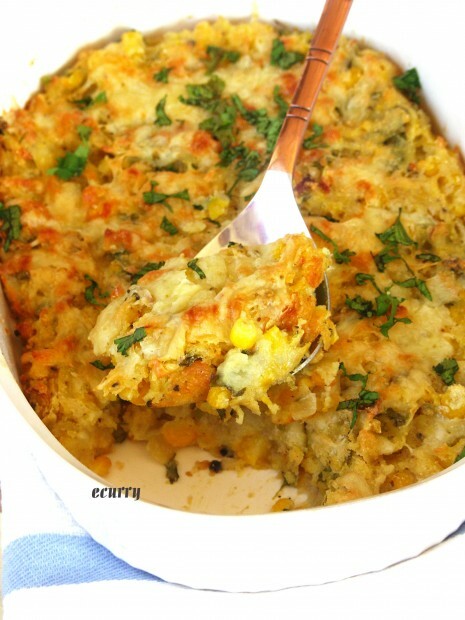 A wonderful way to jazz up the corn – I love the cheese and the jalapeno here, such a delicious casserole! Missed commenting on your posts for a while, got busy with traveling. My daughter loves to have any Non- Indian food and this casserole sounds simple, I am going to try with some mushrooms. Yum! I love the bright flavours. I never tried this tasty looking dish but it looks so lovely & tasty!!! Oh nice! I like the addition of jalapenos and pepper jack cheese. I’d add some sausage and eat it for breakfast! Yummy. Thanks for sharing this, been thinking of what to do with the jalapenos I got from the store last week. That looks beautiful and absolutely tempting! hey this looks so yummy and delicious..will try this out.. Even without egg , the dish is set, amazing! Perfect Southern one pot dish! I love corn!!! This a great side dish! Love all those ingredients, Soma! What a fantastic casserole! A great vegetarian main dish or side dish. This looks so lovely. This is just my type of casserole! I love the flavors! Spicy and delicious. Looks delicious and good for an evening snack. I am surprised that it does not have any eggs in it. What a lovely one pot dish – definitely going to make it before winter dies out! Great corn dish I love corn. I’ll definitely give it a try. I’ve never had a corn casserole before, I am not a big casserole fan usually. But this one looks really really good. I’d just throw in some meat and call it a one pot dish. Bookmarking to try soon! looks and sounds great! Am going to try this this weekend! hi soma this recipe is realy very tasty. Great recipe! I made a couple additions in order to serve it as a main dish – with a bit of a southwestern american feel. First, I fried several pieces of bacon, and after they were crispy, I removed them and drew off all but one Tbls of fat. Then I added a single Tbls of butter and proceeded to soften the onions as per your recipe. I added back in the bacon (crumbled) and about 1 1/2 cups shredded cooked chicken at the same time as the corn meal mixture. I stirred about half the cheese in with the corn mixture and seasoned it all with a modest 1/2 tsp of smoked paprika and a pinch of cayenne. The second half of the cheese went on top. I used a very large cast iron skillet, so I was able to do the whole thing in one pan, stovetop to oven, which is always nice. Huge weekday dinner hit. Absolutely LOVE your version and a fantastic idea to make a meal out of this:). Thanks for taking your time to let me know. appreciate! Tempted to try it! I have been craving corn too! Some corn fritters actually!